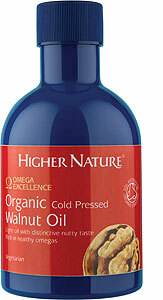 Stir our superior Organic Cold Pressed Walnut Oil into salads, dressings, sauces and deserts. Our walnuts are grown organically in Europe and gently processed in their raw form to retain all their essential goodness. 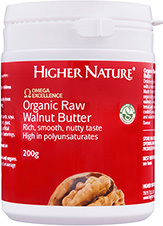 Cold pressed and then filtered, our gourmet walnut oil is cholesterol-free and bursting with essential omegas 3, 6 and 9. With a beautiful primrose-yellow hue and delicious sweet walnut flavour, this versatile oil is perfect for drizzling over salads, potatoes and vegetables, or adding to deserts and smoothies. 2630mg Linoleic acid (Omega 6 EFA), 1109mg Oleic acid (Omega 9 FA), 520mg Alpha-linolenic acid (Omega 3 EFA).